The SF Planning Commission last week approved an influx of high-density office and housing redevelopment, including the West Coast’s tallest skyscraper, in the neighborhood surrounding the new station at First and Mission Streets, known as the Transbay Center District. To ensure that new workers and residents come by transit, foot, and bike instead of clogging the streets with cars, the plan would make sweeping streetscape improvements and limit the amount of car parking in the area. 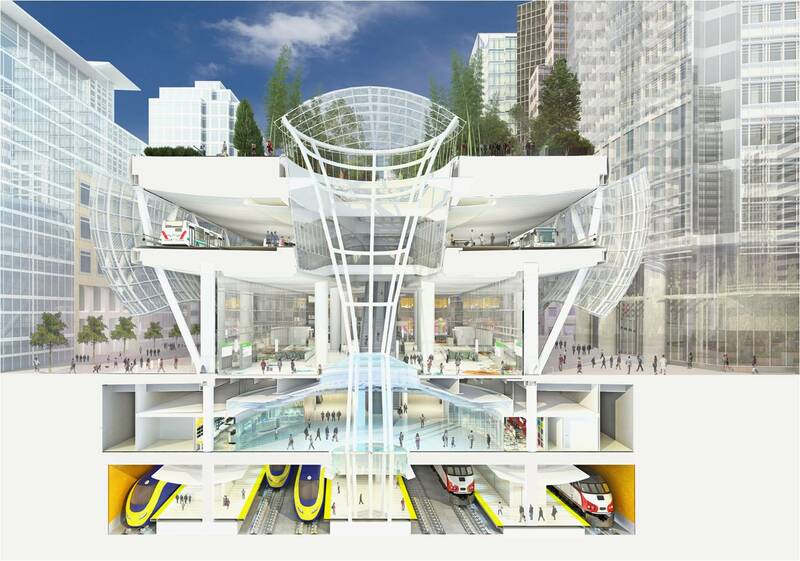 The hub, which replaces the old Transbay Terminal, would connect to transit systems in all nine Bay Area counties, including Muni, BART, AC Transit, SamTrans, and Golden Gate Transit. Caltrain would operate on an electrified system connecting directly to the station, thanks to a recently-approved plan to extend tracks from the 4th and King station. Caltrain would share those tracks with high-speed rail trains. 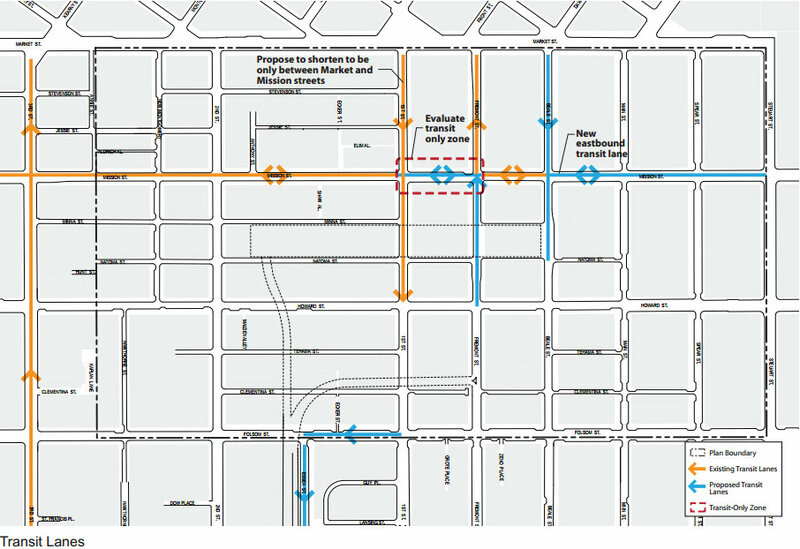 Streets within the plan area — bounded by Market Street to the north, Steuart to the east, Folsom to the south, and just short of Third to the west — would be transformed with improvements for walking, bicycling, and surface transit. Major streets — Mission, Howard, New Montgomery, Second, First, and Fremont Streets — would get wider sidewalks, road diets, transit lanes, and boarding islands. The planning department is also looking at creating a transit-only plaza on Mission between First and Fremont. The plan would also create several “Living Streets” engineered for calmer motor vehicle traffic on blocks of Spear, Main, Beale. These blocks would be characterized by fewer vehicle lanes, “significantly” wider pedestrian space on one side, and amenities like bike-share stations, café seating, and retail kiosks. 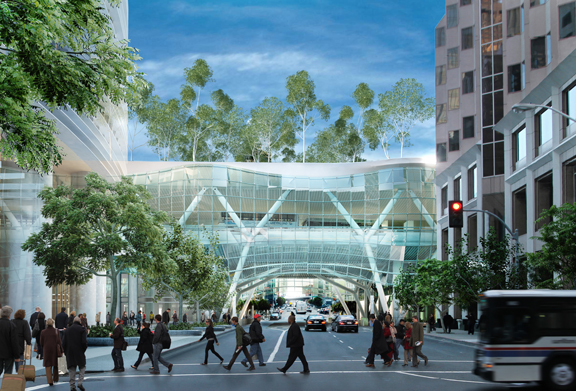 Alleys in the area would also be pedestrianized to help relieve crowding on more congested streets, and an underground tunnel underneath Beale may connect the transit center to BART and Muni’s Embarcadero Station. New open spaces would be created around the station, including a 5.4-acre park on top of the transit center. Bus entering Muni plaza at Beale Street. Bike improvements include a block-long, off-street bike path from Folsom to Howard (between 1st and 2nd) feeding a bike ramp directly into the transit center. Conventional bike lanes would also be added to Fremont, Beale, and Main Streets between Market and Folsom, with a bike box at Beale and Howard. In another bid to reduce congestion from single-occupant vehicles, the plan would facilitate “casual carpooling,” already a regular practice for Bay Bridge commuters, by creating designated waiting areas on some streets. On top of improvements for car-free travel within the area, limiting the amount of parking is also crucial to avoid inundating downtown with more cars, said Joshua Switzky of the SF Planning Department. Cross-section of the station layout. Parking maximums in the district now cap space set aside for car storage at 7 percent of a building’s gross floor area. The current reform plan proposes reducing the maximums by 50 percent, but it might go farther. Switzky said the percentage-based cap could be switched out for an absolute cap, since percentage-based caps “scale infinitely” regardless of a building’s height. “If we don’t change those rules as we’re proposing, there could be over 2,000 spaces built in this transit core,” said Switzky. The district-wide cap — a first for San Francisco — would be determined by a study based on targets for limiting car trips and congestion, he said. Livable City Executive Director Tom Radulovich praised the absolute maximum, saying it would close loopholes often used by developers to build excessive amounts parking in projects like the City Place mall planned in mid-Market. “Unless you really limit office and commuter parking, you’re not going to get the traffic reduction you need to make the streets safe and livable,” he said. 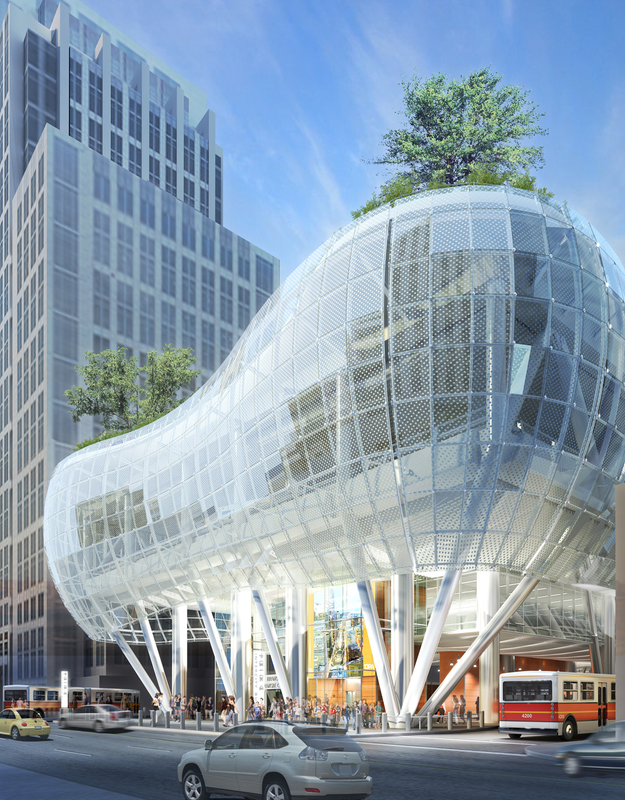 The cap, along with other progressive planning regulations in the Transbay District, should be expanded to consistently enhance the public realm throughout downtown, Radulovich said. 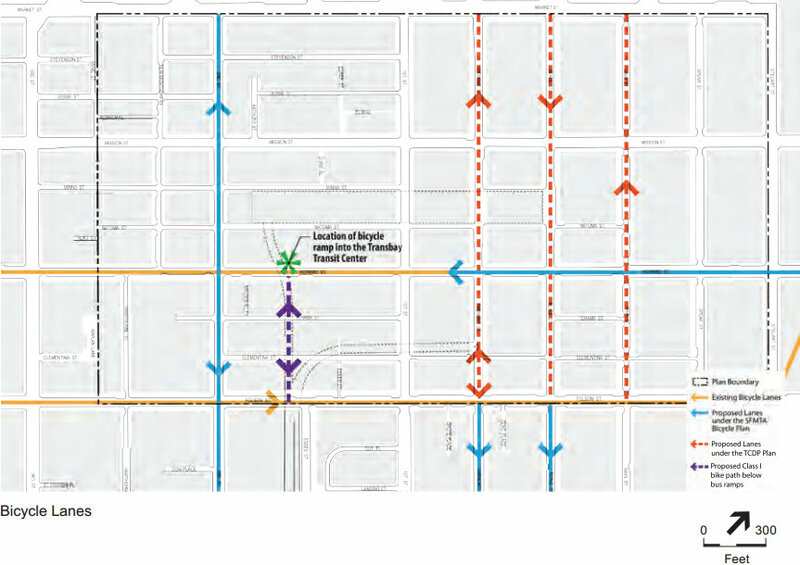 Proposed transit lanes, from the draft EIR comments document ##http://commissions.sfplanning.org/cpcpackets/2007.0558E.pdf##PDF##. See the other approved planning documents on the ##http://sfplanning.org/index.aspx?page=3125##Planning Commission agenda##. I like everything I see, but have some traffic/driver questions: how will motorists get from north of Market Street to the Bay Bride entrance ramps currently located off Harrison Street? Will there be designated routes for that? Will private cars be diverted around this transit district to follow the Embarcadero to ramps on Harrison Street? And if cars will still be traveling through (though not parking in) the transit oriented district, will there still be the same number of lanes leading to the Bay Bridge? Meanwhile in 2012, we have very nice walkways and plazas through most of the block between Market and Mission, from 1st St to the bay (except PG&E), but no way to cross the streets! What would it take to get some crosswalks painted mid-block, so people trying to walk around don’t appear like scofflaw jaywalkers on a highway? (squealing tires and racing engines are common sounds on these blocks). SF has a Transit-First policy on the books and bold infrastructure plans for the future, but can’t envision painting some lines on the street to legitimize pedestrians. As usual, my email to SFMTA sustainable.streets@sfmta.com suggesting the idea was not acknowledged. Pretty cool they’re building casual carpooling into the infrastructure. Very cool stuff! However, it is the traffic coming across Market Street from the north and from parts further west during the evening rush hours that really blocks up intersections and slows down MUNI buses. Add in 400+ parking spots at 8 Washington and 1,000 parking spots for a Warriors Arena, and I think you have to implement an outbound only 3pm-7pm congestion pricing charge for motorists with proceeds going to improved transit, bike, and pedestrian infrastrucure and services. Hate to say it, but the second rendering shows a clearly car-oriented street, and its author has even shown the vehicles moving so fast they are blurred (believable, given the configuration of the street). If there is going to be little or no parking for cars, why is there so much space for them to drive around? Is the Warriors Arena going to add 1,000 spaces? I read the description as they would just use existing parking. Obviously that will change, but wondering where you heard that. But otherwise, totally agree with you! Indeed, these are very car-oriented streets: One-way, multi-lane high-speed arterials. Anyone from SPUR calling this “the best TOD in the world” is seriously delusional. I wouldn’t put too much stock on the renderings, as I think they were created at least a couple years ago when the street plans weren’t too refined yet and have changed within that time (the bike lanes are new, for instance). I get the impression that the renderings were mainly intended to show the architecture of the station. Almost none of the other dozens of images on the website which aren’t featured in this article even show streets. I wanted to use what little imagery there was on streets, but I apologize if the use of it appeared misleading. I would point readers to rely more on what I wrote, which cites from the planning documents approved by the commission, though they lack heavy detail on the street plans. I’m expecting more detailed plans will come. This component strikes me as really, really important for creating a true multimodal hub, and yet this is one of the few references I’ve heard to it. Does anyone know about it? Are there plans for moving sidewalks? Is this only something that “may” get built? 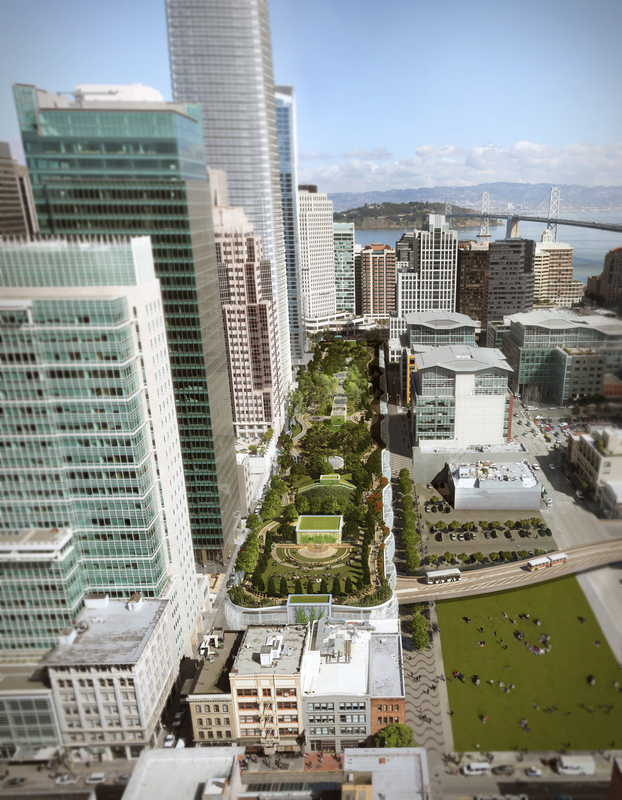 How long will it take to walk from Transbay to the BART/Muni Station? And also, when I look at a map, Beale Street looks much closer to Embarcadero BART than to Montgomery — am I missing something? If, a I suspect might be the case, this component is being put on the back burner by planners, I would suggest that it’s a big deal and should get attention. The tunnel sounded pretty set, it was more the location that sounded unsure. They chose Beale after CAHSRA requested longer platforms, which made it a more central location for the tunnel. They did say it would connect to Montgomery. There wasn’t much more detail available. Apologies if it was written unclearly. To the editors of Streetsblog: I notice not a single attempt to answer my questions as to where and how the area will or will not accommodate automobile traffic from north of Market Street to the Bay Bridge on-ramps. This reflects, I think, the blog’s and readership’s interests in other transportation modes. But that has downside — a blindness to the need to address the persistent presence of private cars. Ignoring drivers, excoriating them, etc. may feel like futurism, but it’s not. So as I ruminated (alone, and surely not as fruitfully as I would have with others’ input) about how to bring car traffic to the Bay Bridge in a good way, Perhaps we should put Bridge approaches underground throughout this transit district. Expensive, but that would humanize the above ground streetscape. There wasn’t substantial information available on car traffic impacts, nor have I heard any concerns raised about substantial congestion to and from the Bay Bridge that might result. Planners say some lanes north-south lanes would be removed, but specifics aren’t available, and there’s no indication of major changes to road capacity. The main intent of the article was to provide the latest information available on how this project would change the area, and I can assure you no substantial or pertinent concerns that I’m aware of have been omitted. No kidding. Aaron did not drop everything and run to the architectural firms and planning departments involved and demand exact plans for a project that is still in its infancy so he could give an answer to an anonymous blog commenter. Aaron, thanks for the update. I appreciate it. Murphstahoe, well, what can I say? You are a mensch of the first order. Actually, I got a call yesterday from SFMTA saying they were going to study my request for mid-block crosswalks between Market and Mission, from Beale to 1st (did someone see this comment?). I really appreciate the the effort, but he didn’t sound very optimistic, because of things like safety, volume, and “not slowing down traffic.” Unfortunately, looking at the streets around here, I have to take this as “it’s not safe to cross the street because there are too many cars going too fast, which is they way we designed it.” What a huge nod to pedestrians if it did happen, though. with latest design of road, building. And other infrastructure is so attractive. You have focused on all of sidewalk widening, bicycle improvements, transit improvements. Thank you so much for your sweet dream.